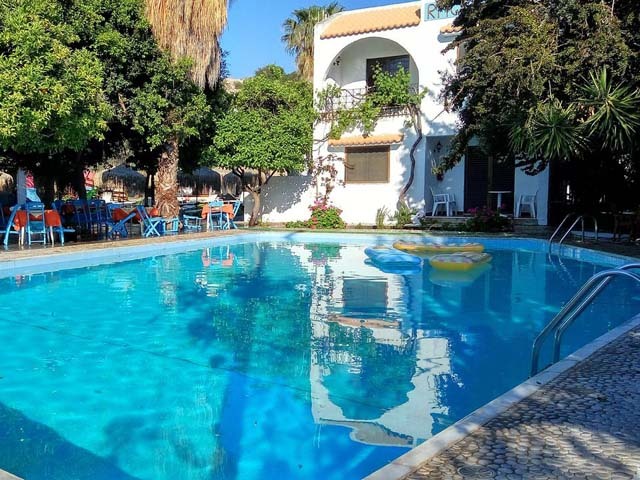 The Iris Hotel has beautiful gardens with a children’s play area in the shade of the trees, has money exchange facilities, safety deposit boxes (payable locally), table tennis, pool tables, baby cots and high chairs. Nearby the hotel in Afandou city there are a variety of restaurants, bars, shops, supermarkets, Banks, Post office and a Bus station for all island famous sightseeing as Rhodes old town20Km,Lindos 30Km, Faliraki 6Km,Waterpark 8Km, Kolymbia 6Km, Valley of butterflies, Tsambika Beach 8Km, Seven springs 12Km, etc. The IRIS HOTEL offers 54 comfortable rooms, ideal for 2 - 3 & 4 persons. In all rooms you will find a fridge, direct dial phone, bath with shower, balcony/terrace and A/C ( payable locally). 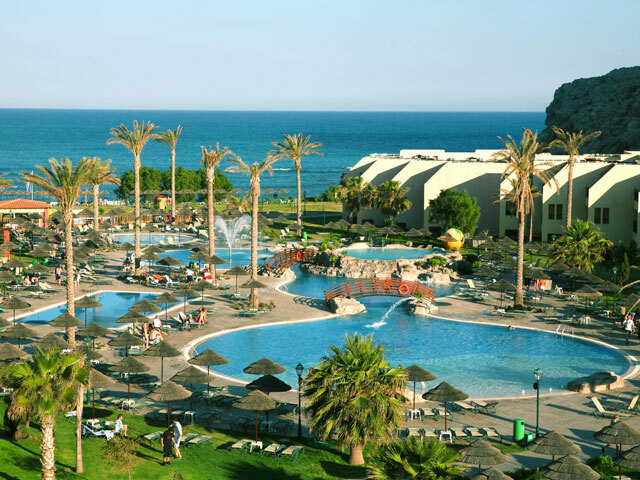 The hotel is set in a hillside location 19 km away from Rhodes Beach. Set within a 10-minute walking distance from Afantou city center. Shops and a supermarket are also set close by. 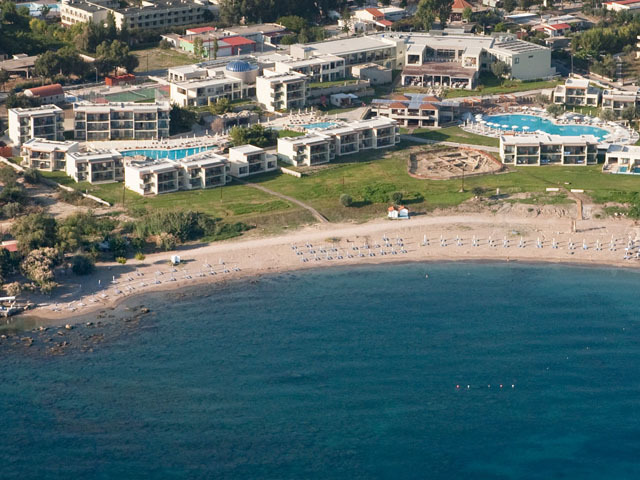 Iris Hotel lies within 20 minutes’ drive to Diagoras airport. Iris Hotel features 54 guestrooms with a minibar, satellite television, pay television, a wardrobe and a sofa. Many guestrooms offer views of East Coast and the Aegean Sea. Guests can make use of en suite bathrooms with a shower, a hairdryer and bath sheets. Cribs, a play area and a game room are offered for guests with children. The on-site activities include hiking, table tennis and darts. Every morning at the café guests may enjoy buffet breakfast. The 24-hour restaurant provides special meals. Guests can try refreshing drinks in the poolside bar. 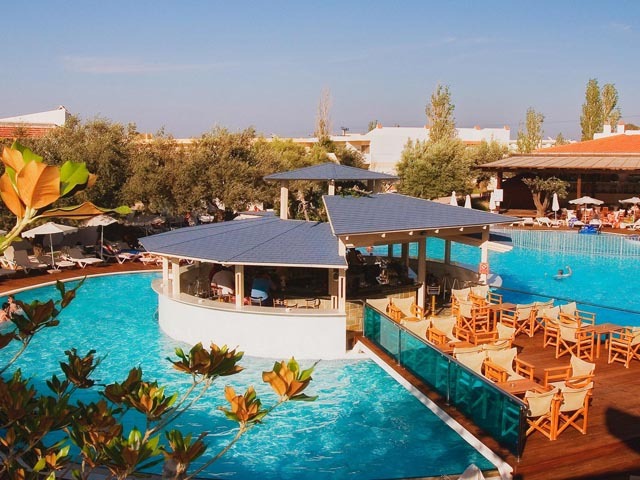 A variety of dishes are served in Mimis Taverna and Michalis Restaurant Cafe Bar, which are 5 minutes’ walk away.